One of my fav meals is homemade lasagna! I could seriously eat a whole pan. 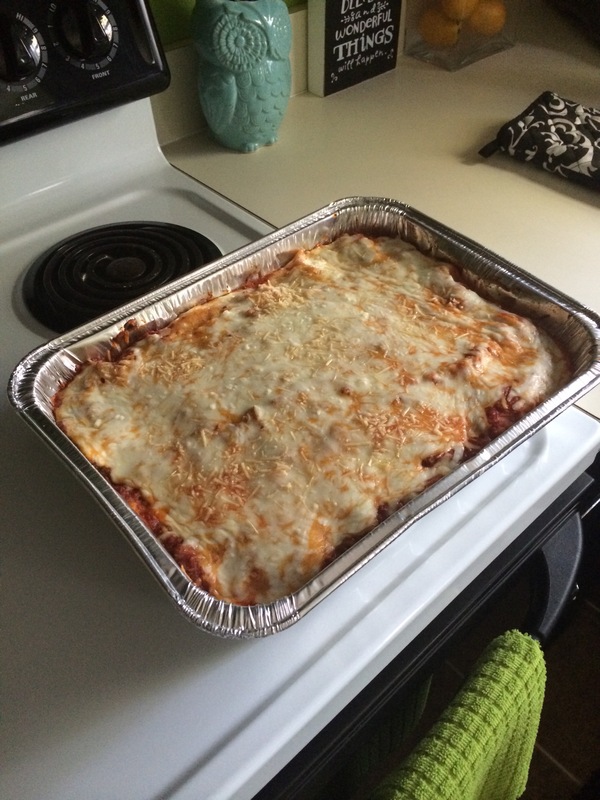 A few months ago, when I had a lasagna craving, I found a recipe by the Neely’s. Side note, I’m still a little bummed that they broke up. But I’m kinda not surprised because I’ve always said that a couple who is that over the top with the lovey doviness is probably clawing each other’s eyes out at home! The first time I made it, I was puzzled about why the recipe didn’t call for seasoning the meat, so I added seasoning while cooking the meat, plus added the seasoning that the recipe did call for and it came out salty. This time I followed the instructions and it came out perfect! I also made a few other adjustments to the recipe. I used regular lasagna noodles instead of the no boil kind because I just don’t like the taste of the no boil kind. I also used crushed tomatoes instead of stewed because I mean hello, why chop them when you can already buy them crushed? I used ground turkey and mild Italian sausage. I used ricotta cheese instead of cottage. And I also used lowfat cheeses. Here’s the original recipe. If you love lasagna, you’ve gotta try this one. Delish!!!! It was good was good the second third day. It sure was dad. Glad you enjoyed it! Good point about BPA free cans! I’ll have to look at that next time, thanks!!! And I’d love to get beer, wine, heck whatever kind of cocktail recommendations you think of that would pair well! That is absolutely hilarious!!! And now I feel like I need to follow you, what’s your name on IG? I love lasagna! Since I’m a pescatarian I use meatless meat when I make it and it’s so good. That’s a great idea! What brand do you use? I’ve never tried any meatless products, but I’m not a big meat eater, so I’m open to trying it!